I am very proud of the Heart of England Master Thatchers team on this job. We have made great progress on this monster straw job as it has been 5 weeks so far. We are currently giving this property a flush ridge, a new eave line and massive rolled gables. Here at Heart of England Master Thatchers, we do as we are asked as well as giving advice when needed. After each job we do we give as much advice as we can for you to maintain a healthy looking roof. A ridge must be replaced every 8-12 years even if it hasn’t started to decay, as soon as you leave it to decay there could be more damage than you think. What is a Flush Ridge? There are two different types of thatched ridge with various names. A ‘bottom edge’ is the type of ridge that has been raised from the other thatch by a few inches and can be cut into any ornamental pattern. Then there is the ‘flush ridge’ which is as the name suggests flushed with the underlying thatch, giving it a seamless effect, almost like not having a ridge at all. It is worth noting that if a ridge is looked after correctly then both flush and block ridges will last equally long. 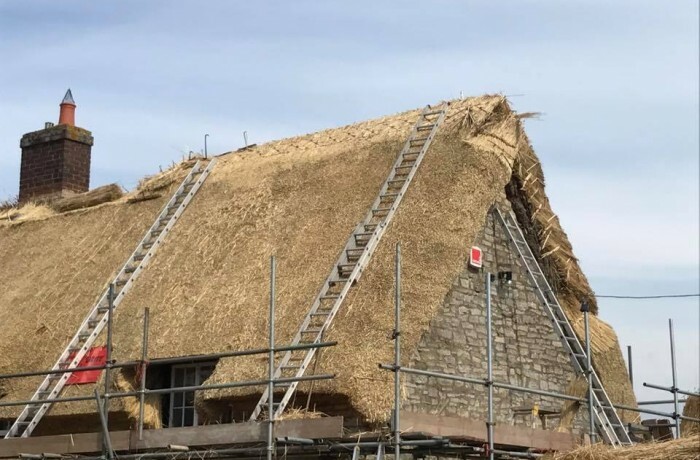 A ridge is what seals the top of your thatched roof and can be completed with many different materials such as straw, water reed or sedge. If you need any roofing issue looked into or have a question regarding thatched roofs then please don’t hesitate to get in touch with us!